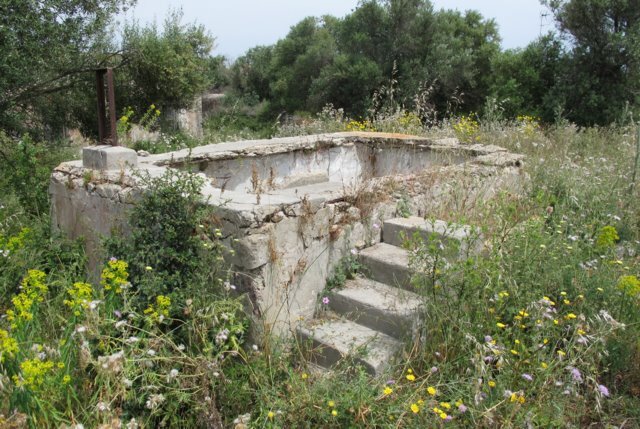 It’s an extraordinary story: in July 1943, Italian Admiral Leonardi manned an abandoned gun battery almost alone against the might of the Royal Navy. Firing several shots, he forced a British ship to turn and flee. But is the story true? The fresh-water cistern at battery AS362 in 2015. Is this the symbolic site of an act of Italian heroism and leadership by Admiral Leonardi? Admiral Priamo Leonardi was in 1943 the commander of the Piazzaforte Augusta-Siracusa (PA-S), a fortified zone on the east coast of Sicily that surrounded the port cities of Augusta and Syracuse. The PA-S was controlled by the Italian Navy. However, apart from a few companies of sailors, it was mainly garrisoned by second-line territorial army troops, who manned pillboxes and roadblocks. There were also some artillery batteries belonging to the army corps. But its key defences were the many coastal gun batteries in the zone. These were crewed by men of the Milmart, a fascist “Black Shirt” militia. There were 24 of these batteries, spread over some 30 miles as the crow flies, from south of Syracuse to north of Augusta. This mix of separate services and fiefdoms, across such a large area, did not bode well for a coordinated defence. The Allied invasion of Sicily began on 9th July 1943 with Operation Ladbroke, a massed glider assault designed to facilitate the rapid capture of the port of Syracuse. The British airborne troops first seized the Ponte Grande, a bridge which crossed the river Anapo just south of the city. Leonardi’s HQ was further north, near Augusta, but as soon as he understood the scale of the attack he rushed to the front line facing the Anapo, to assess the situation and encourage the recapture of the bridge. He was later criticised for gadding about the battle zone, out of contact, instead of coordinating his forces from his HQ. At times the roads in the PA-S were, it seems, full of officers looking for him. On the other hand, he might have been even more out of touch if he had stayed at his HQ. Italian telephone and radio communications were poor even before the invasion, and failed or were cut as the fighting increased. One contemporary commented that Leonardi was rather “garibaldino”, impetuous. The word is a reference to the Italian hero Garibaldi, a dashing freedom fighter and the figurehead of the forces that brought about the unification of Italy. Certainly, following his excursion to the Anapo front, Leonardi spent the next few days dashing from unit to unit, to bolster morale and to keep in touch with his disparate and dispersed forces. He was also described as “valoroso”, and so recklessly brave that he almost seemed to be courting death. It was said that he did all one man could do to defend his command. Crucially, however, it was early on Leonardi’s watch, where he wasn’t watching, that the PA-S began to collapse around his ears. While he faced front, concerned about events south of Syracuse, he wasn’t looking backwards at events around Augusta. Events south of Syracuse were certainly bad enough. While the bulk of the British seaborne forces landed some miles away, the SAS (operating as the SRS or Special Raiding Squadron) were landed on the Maddalena Peninsula just south of the city. The peninsula was poorly defended by a few second-line territorials, but it was also the site of no less than four Milmart gun batteries. Here, in the words of a British admiral, the SAS “carried fire and the sword” to the hapless Italian defenders. Two of the batteries were overwhelmed. The crews of the other two batteries sensibly ran away. So great was the threat to Syracuse that the first Italian regular army unit to arrive in the area to support the PA-S was directed urgently towards the Maddalena Peninsula. It was ordered to throw the SAS back into the sea. The abandonment of the last two Maddalena batteries by their Milmart crews was the beginning of a tear, that turned into a rip, that became a rent, that finally tore the PA-S apart. Unbeknownst to Leonardi, the Milmart crews of many of the remaining batteries in the whole of the rest of the PA-S now abandoned their posts. Many of the militia men were local. Mistakenly fearing instant execution by the British for being fascists, they removed their incriminating black shirts and melted back into the population. Others headed for Messina, the naval base in the far north of the island, hoping to escape to the mainland. Before they left, they disabled or sabotaged their guns, so nobody else could use them. Many of the batteries had not fired a shot that day, except perhaps at passing aircraft or imagined raiders. And not one of them was immediately threatened by the British, who were still many miles away. This catastrophe for Italian honour and Italian arms was a godsend to the British. When it was learned that Augusta had been abandoned, Operation Glutton was cancelled. This was an airborne operation designed to seize a bridge outside Augusta, in much the same way that the Ponte Grande had been seized outside Syracuse. Now it was superfluous. Meanwhile the Royal Navy rushed ships directly to the harbour at Augusta. This would have been impossible if all the batteries had still been manned. The SAS were also despatched to the city to seize it in a seaborne landing, while the main British forces slogged up the road from Syracuse. The scene was set for Admiral Leonardi’s Wild-West-style, lone-gunslinger shoot-out with the Royal Navy. Leonardi was not totally absent from his HQ during the invasion. He kept returning there between his field trips. On one of these touch-base visits he spoke to two Milmart men whom he had requested as liaison officers. One of them told Leonardi that it might be possible to put his battery back into action. The battery was situated on the heights of Mount Tauro, east of Augusta. It was a dual-purpose battery, designed for both anti-aircraft and anti-ship fire, and it had clear views of the waters off Augusta. Rather than being blown up, its guns had been disabled by removing the breech blocks and throwing them into the cistern of the battery’s fresh water reservoir. This meant that the guns could be reactivated simply by retrieving and refitting the breech blocks. In gung-ho, Captain-Kirk style, Leonardi did not delegate and despatch a team, but instead decided to go and see for himself. Not only did he not delegate, but he also took with him his chief of staff, the man whom he normally left behind to look after the HQ and act as his deputy in his absence. Given how it was becoming apparent that he did not know whom he could trust, this made desperate sense. The other people in the Admiral’s vehicle on this extraordinary trip were his driver and the Milmart officer. One version of the story almost sounds as if Leonardi was alone at the guns. Clearly he wasn’t, but compared to the 100-odd Italian heavy guns around Augusta and its bay, and the 1000-plus men that should have been manning those guns, he might as well have been. The story tells how Leonardi and his tiny force found the breech blocks in a well or ditch, remounted them, and then fired with such bravado at a British destroyer entering Augusta’s harbour that it turned and fled. The wrath of the Royal Navy was then visited on the admiral and on the battery in a storm of fire from two cruisers. 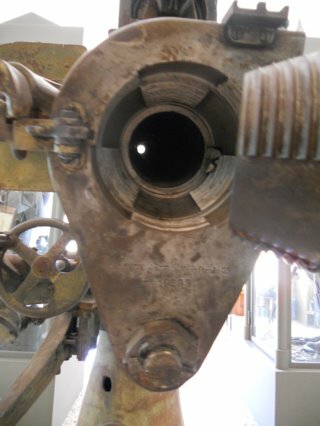 The open breech of an Italian Breda 76/40 gun, standard equipment in the batteries of the PA-S. The breech block is on the right. This gun is in the excellent military museum at Chiaramonte Gulfi. In his history of the invasion of Sicily an Italian general later exclaimed: “If these few shells had this effect, imagine if all the batteries had gone into action!” But of course, the Royal Navy would never have let that happen. It was precisely because of this extravagance of seaward-facing guns that the assault on Augusta was originally planned to take place from the air and the land, and not (except for long-range barrages at a safe distance) from the sea. It was only the unexpected abandoning of Augusta, and of the batteries, that allowed the Navy to try to capture the city. Leonardi’s own account of what happened is a little drier and more credible than the story above: “Driver Caraco was roped and lowered into the cistern. He brought to the surface a couple of breech blocks, and these were remounted on the guns. The front of the battery faced the harbour of Augusta. Since an enemy destroyer was exploring the entrance of the harbour, we tried to fire one of the guns. Given the lack of a range-finder and the state of the sights, the few shots we fired were wildly inaccurate and so we stopped.” Leonardi does not say that the destroyer fled (he does not mention it again at all). He goes on to say that on his return to HQ he ordered the head of the Milmart to scrape together a crew and have it sent to put the battery back into action, however limited. Leonardi also does not mention coming under fire at the battery, although he does describe the routine heavy shelling that several British ships applied to the area as a whole, and to the batteries in particular. He himself saw the two cruisers when he was at the battery (which British records show was specifically targeted, but earlier in the day). So it is in fact possible that the shots fired by Leonardi did indeed bring about a sudden exit of British shipping from Augusta’s harbour. But what does all this have to do with the SAS? The incident with Leonardi, the battery and the destroyer took place in the early afternoon of 12 July 1943. The SAS did not try to land in the city until nearly sunset. But when they did, they came under a blizzard of fire from machine guns and, yes, some shots from a battery. The SAS’s mother ship was HMS Ulster Monarch, in peacetime a passenger ferry that crisscrossed the Irish sea. Now she was anchored just off Izzo Point, at the southern tip of Mount Tauro east of Augusta, and was right under the bluffs where battery AS362 was sited. AS362 was the battery identified by Leonardi’s chief of staff as being the battery where he and his boss had made their stand (although other sources thought it was battery AS674, further inland). A post-war inquest reported that the battery was also manned again later in the day, so perhaps it was indeed the guns of Leonardi’s battery that were firing on the SAS and their escorts. 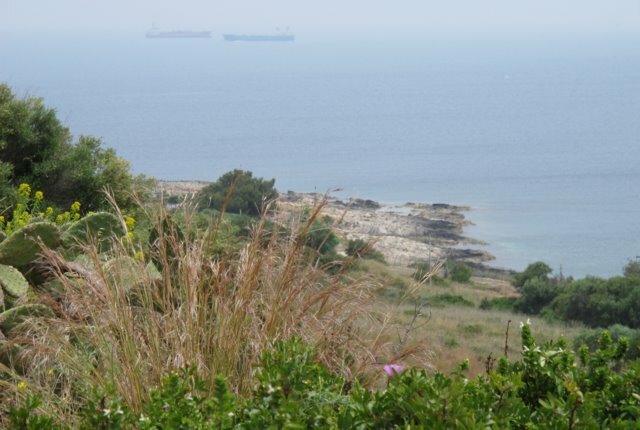 The rocks of Izzo Point seen from the top of the bluffs close to battery AS362, possibly the site of Admiral Leonardi’s heroic stand. HMS Ulster Monarch anchored 2 cables (about 350 yards) from the point to launch the SAS. Judging by the response of the three British destroyers accompanying Ulster Monarch, the threat could precisely have been coming from the AS362 bluffs. An Admiralty photo in the Imperial War Museum (here) shows a destroyer, in a sea splashed with gunfire hits, blasting the headland where the battery was sited. Smoke or dust, probably from the explosion of naval shells, can be seen drifting across the top of the bluffs. Ulster Monarch herself added to the fire of the destroyers with her lone 12 pounder gun (for an SAS eye-witness account of this, see Peter Davis’ recently-published book). Under this barrage of protective fire, the SAS in their landing craft ran the gauntlet intact and landed on the east side of the deserted city. Is it true then that Leonardi’s almost single-handed reviving of the battery had not only delayed the British entry into Augusta, but also threatened to blow the SAS out of the water? We will never know for sure, but it is tantalisingly possible. Whatever the case, it is an extraordinary tale of an extraordinary man. The Armed Forces commander in Sicily at the time wanted to court-martial Leonardi for incompetence, but he was overtaken by events. There were accusations of betrayal and cowardice. The Fascist rump republic condemned Leonardi to death in his absence. The sentence fell away when Fascism did. A post-war commission of enquiry into his actions and the collapse of the PA-S was established, staffed by senior officers of both the Army and Navy. After gathering extensive evidence, they exonerated Leonardi. Later still, an author was prosecuted for defamation after accusing Leonardi and other Navy officers of conspiracy and treason. Leonardi was again exonerated. But to this day there are conspiracy theorists who think this was all a whitewash and cover-up. Anyone who has seen the thousands of pages of testimony in the archives in Rome will find this unlikely. Although some of these records of course contain the usual partiality and self-serving exculpations (as do the memoirs of many a British senior officer), nothing in them indicates a cover-up. Since writing this piece, I have seen the account by the Milmart officer who was the fourth person in Leonardi’s car, Eduardo Caforio. It makes it clear that the gun battery in question was AS674, not AS362. Caforio describes remaining at the battery after Leonardi left. He later fired 27 shells at a British destroyer that was protecting “a passenger ship of more than 10,000 tons” which was landing troops. Although this tonnage is too great for Ulster Monarch, Caforio was presumably mistaken or exaggerating, as there were no other troopships in the vicinity, so it must have been Ulster Monarch. The military museum at Chiaramonte Gulfi, where the photograph above of the breech of an Italian 76/40 gun was taken. This entry was posted in All Posts, Battlefield Visits, Operation Husky - Sicily 1943, SAS Special Raiding Squadron (SRS) in Sicily and tagged Augusta Sicily 1943, Battery AS362, Battery AS674, Italian artillery, Operation Husky Sicily 1943, Operation Ladbroke Sicily 1943, Ponte Grande bridge, SAS Special Raiding Squadron (SRS), Special Air Service Regiment (SAS) in Sicily. Bookmark the permalink.